ground, and generally looking around and asking myself “what if”? I moved a few of the dogs back from the river bank into the woods. The wheeler was already parked on the far side of the tracks, as the water under the bridge was too deep to drive it through. I carried some gas out to fill its tank. There were a few things I was worried about, but couldn’t do much about. The snowmachine. 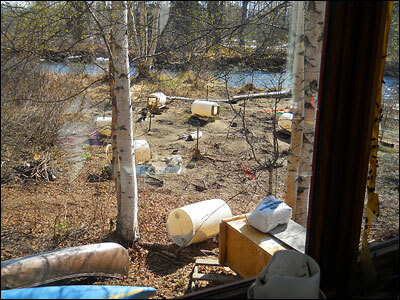 The dog houses ( which are plastic drums and would float). The firewood I had spent the last three months accumulating to avoid a repeat of last winter. 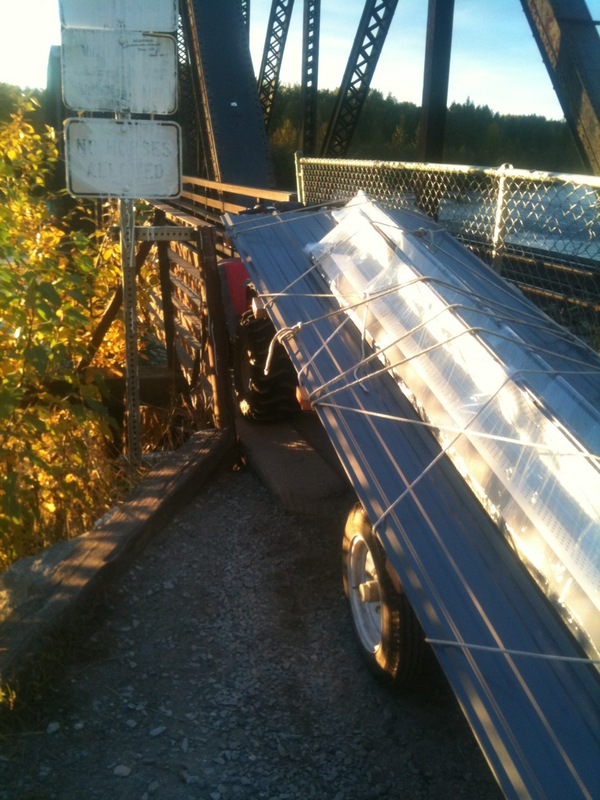 And the newly purchased pile of metal roofing! All of this stuff I would have liked to move to higher ground. Except they were already on the highest ground I have. It would have to be enough. In the afternoon I made a quick trip to town and got some work done, but I didn’t want to be gone long, and soon headed back across the river in the ceaseless pouring rain. Darkness came without the river rising a whole lot more. I went to bed, slept poorly and awoke often to walk down and check the river level by flashlight. The forecast was for actual sunshine on Friday, maybe this was as bad as it was gonna get. Not. The lower bench, Friday morning. The river spreading out overland. Looking out what is normally the wheeler trail towards the bridge. Photo by Elf. Around ten A.M. I realized I had made a strategic error. On my short trip to town Thursday, I had been in too much of a hurry and had not charged up the reserve batteries for my phone. Now I was running out of juice. Under the circumstances. I didn’t like the prospect of being out there without a communication link. I decided I would make the shortest trip I could into town, charge up, and head right back. 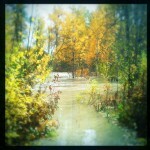 When I got to the bridge I discovered that the entire Chase trail southbound was about two feet underwater. The only way left to get to town was on the elevated railroad embankment, on foot. I started walking down the tracks. About halfway to town my phone rang. 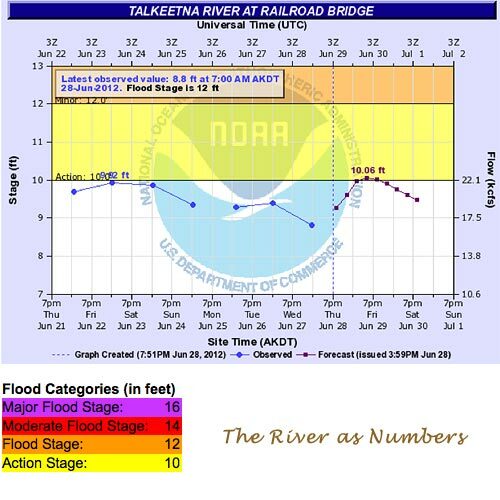 It was Steve Durr, asking if I had heard the news: There was a three foot “wall” of water due in an hour, and Talkeetna was being evacuated. I turned around and started walking back towards the cabin. Then I remembered that Steve had a generator. I called him back and asked if I could use it. Yes, and would I also grab a couple of valuables out of his tent as well? Yes, I would. On the last gasp of my phone, I called for reinforcements. Annie was 115 miles away in Anchorage, having just arrived at work. I quickly described the scenario, expecting the phone to die any second. Would she come up? Yes. She was on the road in about 5 minutes. I pocketed the now dead phone, and started thinking about how I was going to get to that generator, and get it home. A calm and beautiful night. 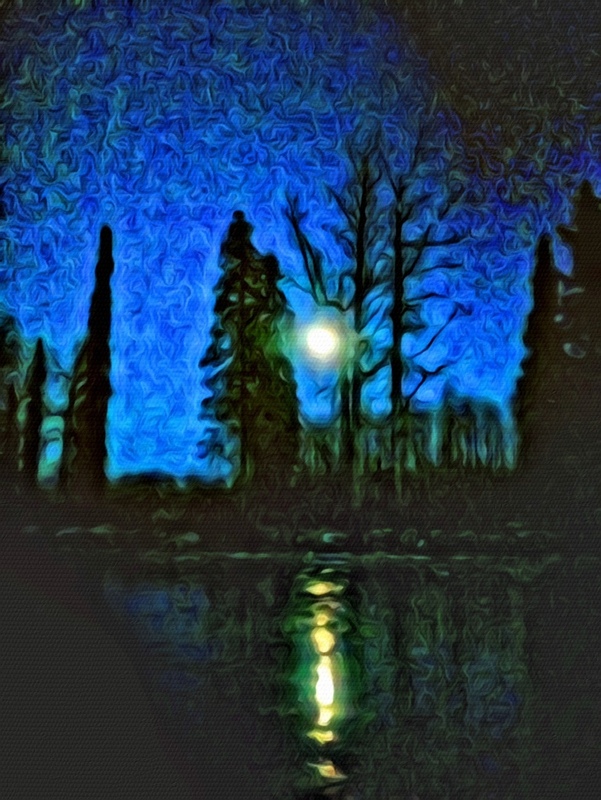 The full moon rises in silence over the river, which is serenely carrying chunks of ice through the golden stripe of reflection. Rampaging floods, ripping trees out by the roots, endless rain? Who, us? Wednesday night, September 19th it was pouring rain all night. This was not remarkable at the time, since it had already been pouring rain for as long as anyone in town could remember. The river roared all night, as it did every night, invisible in the autumn darkness. A soggy Thursday morning dawned, eventually, and I reluctantly crawled out of a warm bed and glanced out the window at the dog yard, as always. Suddenly, as Han Solo would say, I had a very bad feeling. 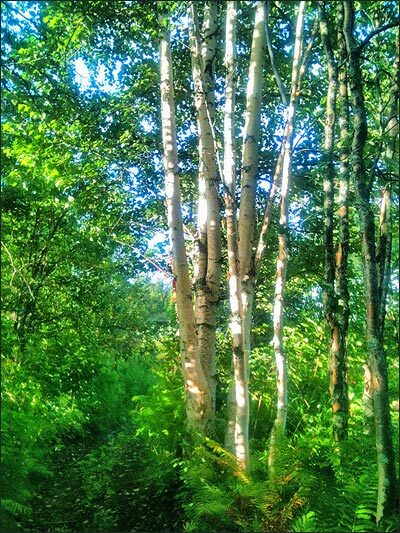 The back of the dog yard is framed by a nice big clump of birch on the river bank. The dogyard in more peaceful times last spring, with the birch clump behind the dog houses. Except that it wasn’t. The big clump of birch was gone. It was a sensation like waking up and finding that one of your teeth is missing. There was a great big space of nothing where the tree had been, and the dog yard felt naked and exposed to the rushing river. 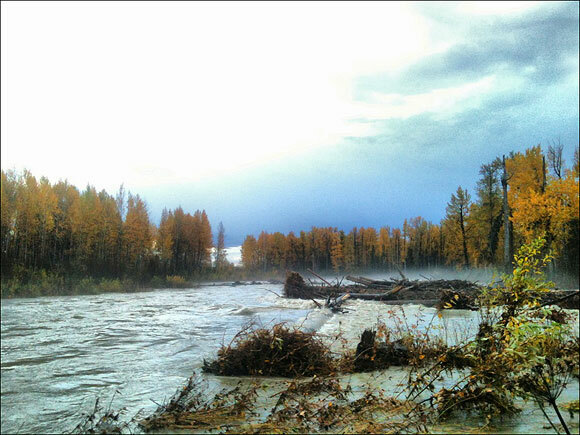 The river was practically deafening, and raging like an angry beast. 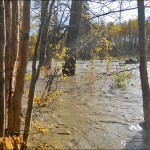 Trees way bigger than my missing birches streamed past and slammed into the log jam. Some of them were hundred foot tall -I mean long! – cottonwoods four feet in diameter. The scene out front. You will have to provide your own soundtrack. Talk about famous last words! That was how I ended my previous post. 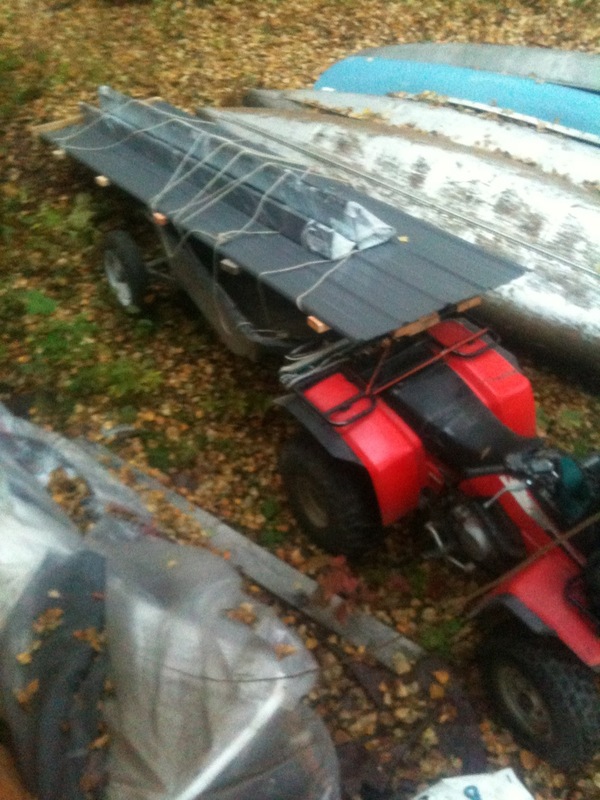 The minute I got the roof metal in to the cabin it began to rain. And rain. And rain. Not rain-y. Not wet weather. Not showers, or drizzle. RAIN. Pouring down, hammering rain, all day and all night. For two months. Not only did I not get any roofing done, it soon became doubtful whether there would even be a cabin on which to put the roof. The whole thing was kind of nightmarish, frankly. It all peaked on September 21st with the Big Flood. I’m writing this a month later. Besides dealing with the flood, and then, finally, the roof, I have been having a hard time getting this posted because I want to tell the whole story, and it’s a lot to write. I have now realized that I can just post it a chunk at a time, and consolidate later if I want. Or not – this a blog after all. 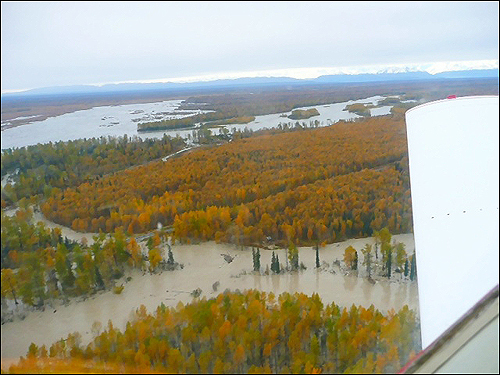 So, for starters, I will show the picture that pretty well sums it all up, taken by local pilot Jim Okonek on September 21st, at the height of the flood. More of the story to come… in part two. Look for the cabin, just below the center of the picture, framed by two pairs of spruce trees. The Roof Project, phase one: Getting the stuff in. The cabin still does not have a real roof on it. It’s plywood covered with tarps. Works okay, got through two winters just fine, but it’s time to get some real actual roofing on the place! As usual, getting the materials on site is half the fun. I’m using sheet metal panels for low maintenance, no moss growth, and letting the snow slide as easily as possible. All good, but bundles of shingles would sure be a lot easier to transport! This stuff is heavy, must not get bent, and has sharp edges ready to cut your hands or viciously attack the nice paint on the panel next to it. 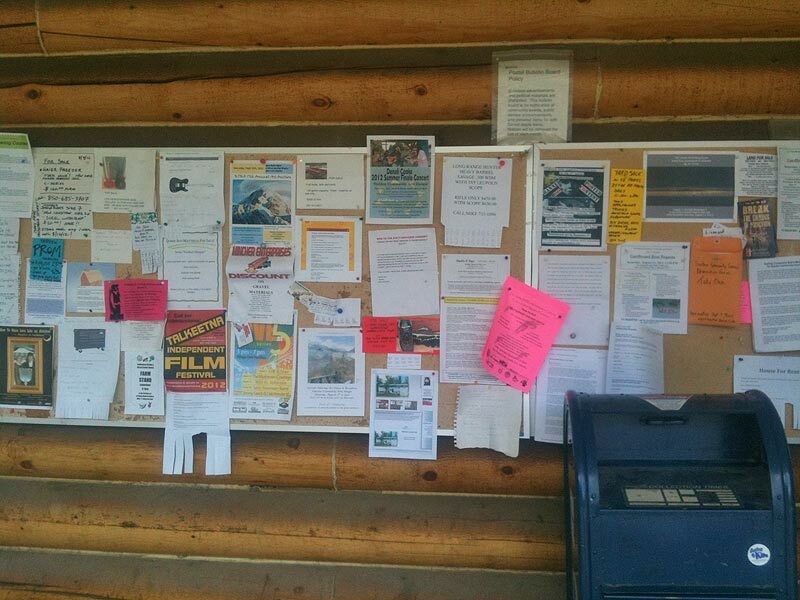 The panels are twelve feet long, and flexible. 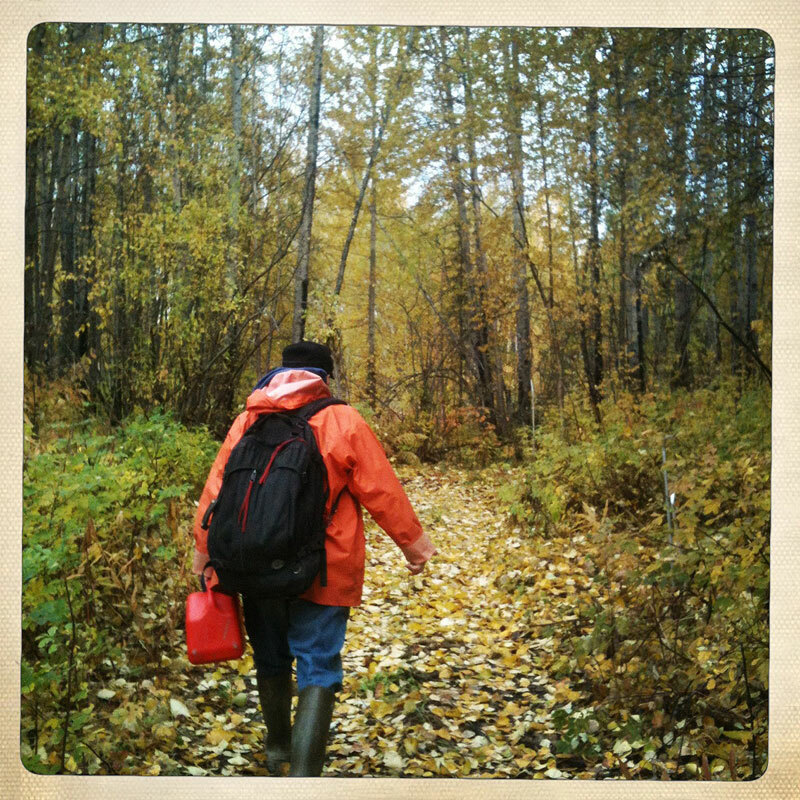 Pretty much impossible for one person to carry, so the portage to the river to use the canoes didn’t have much appeal. That leaves the wheeler, overland. 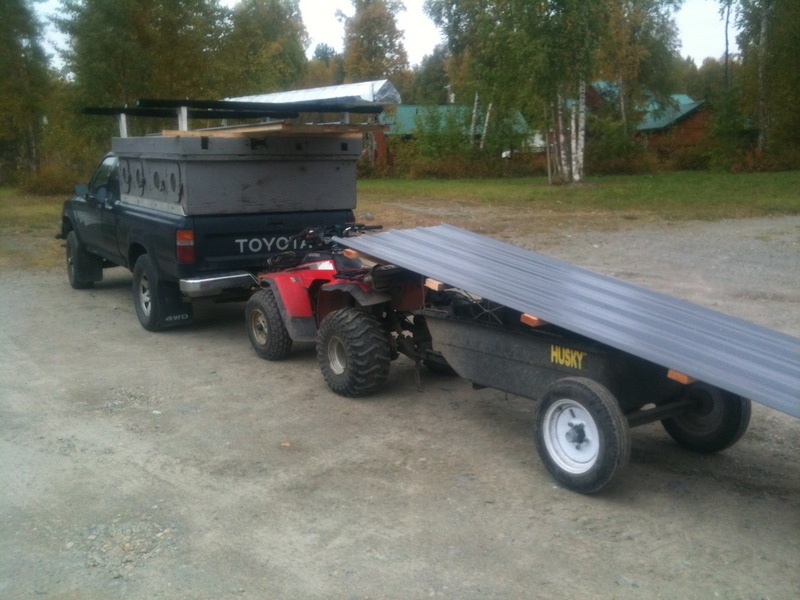 The wheeler trailer is about 4 feet long. Hmmmm. Here is my solution, a “fifth wheel” style rig. 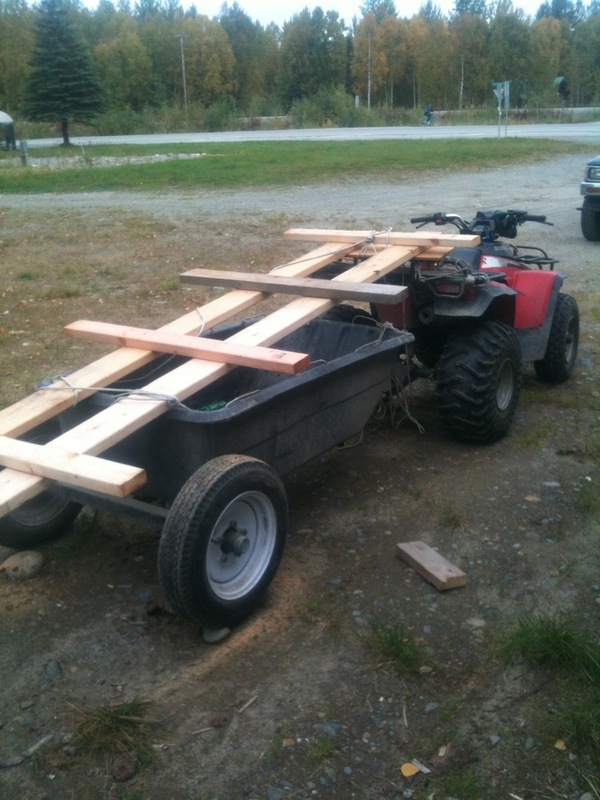 I built a framework for the panels and attached it at the front end directly to the rear rack on the wheeler. I used a single point of attachment, lashed with rope, so it would be free to pivot. 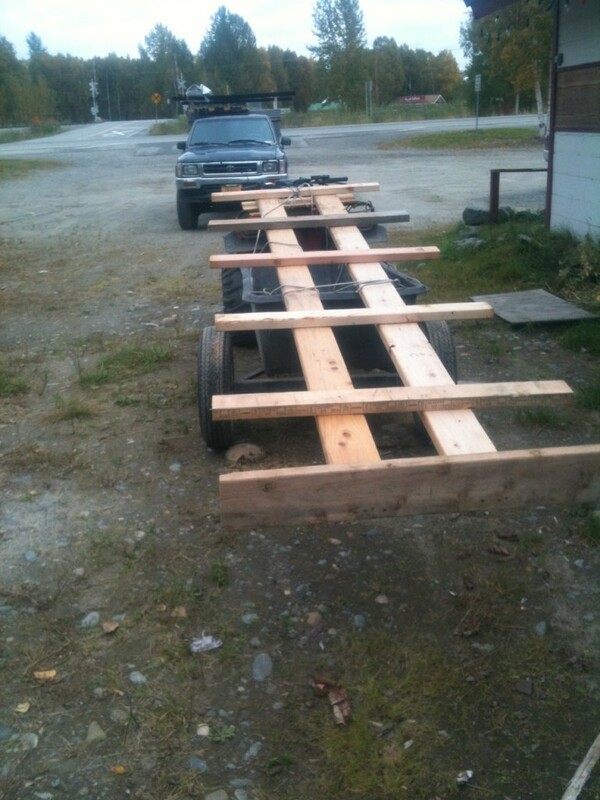 The rest of the framework rests on the trailer. I got some friends to help me get the panels off the truck. (Thanks, Christie and Francine, and thanks to my brother Jim for helping me get them ON the truck) . Then the moment of truth – would the thing work like I thought, and could Frankie ( the wheeler) pull it? Piling the panels on Frankie’s back. Yes, of course he could! Success! All the panels survived the trip. Now if it will just quit raining I can start roofing. Made it! All panels intact and at the cabin. 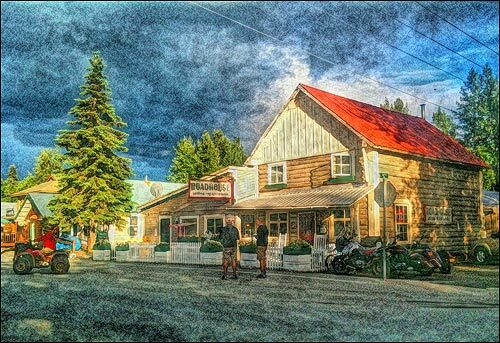 Every year in August it starts to get dark at night. And every year I take it as an affront. What’s this nonsense? How am I supposed to see? 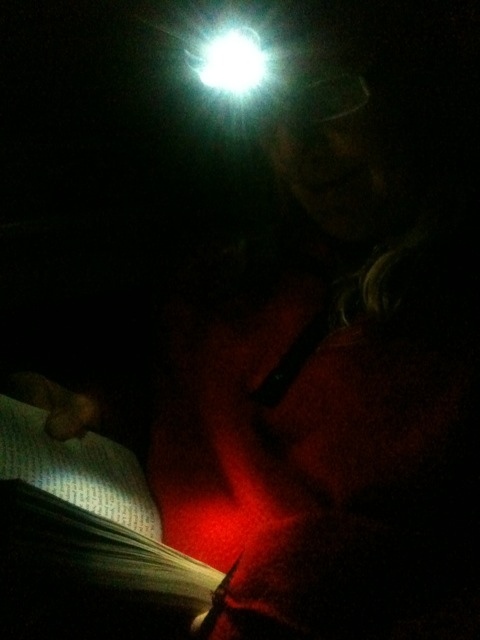 Time to dig out the flashlights and headlamps. You know, from that special place I put them so I would remember where they were. Um…. People generally assume that midwinter is the darkest season here. Wrong. Least hours of sunlight, yes. But darkest, no. The darkest time is now, with leaves still on the trees and no snow. It’s the only time we ever have can’t-see-your-hand-in-front-of-your-face dark. When the leaves go away and expose the sky, and snow covers the ground, it is never this dark again. This then is also the only time of year there can be scary noises in the woods and you absolutely can’t see anything. And the bears are still out and about. Not my favorite scenario. The bulletin board is also a “social media space” where you run into your neighbors checking their mail and reading the board. Usually just a brief conversation, how are you, the weather, etc. Kind of like Twitter, but in person. Craigslist, Twitter and Ebay, all in one. Beyond virtual. It’s August, fall is here. Actually I see the very first signs of fall about July first. A yellow leaf here, a red leaf there, where before was only green and more green. Nothing much, but the message is pretty clear. By mid-August there is a lot of color in the undergrowth and the trees are just starting to show signs of changing. 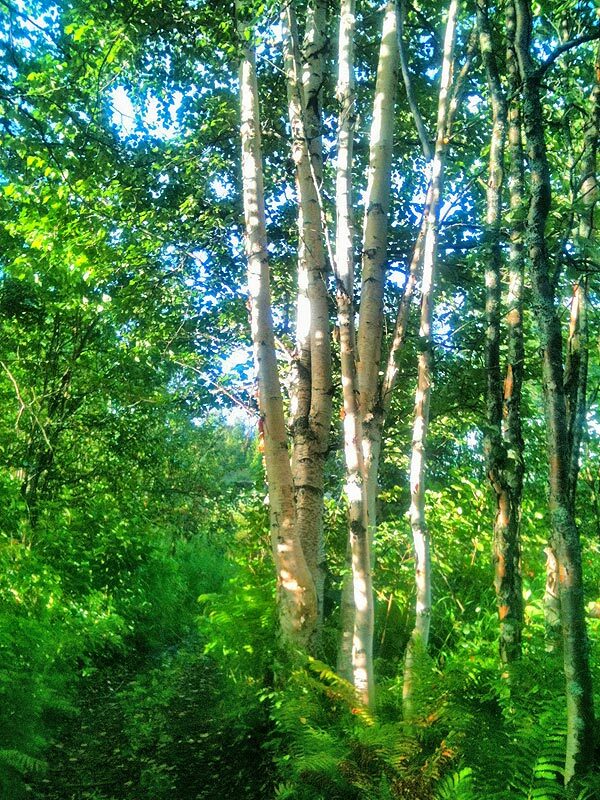 My Commute: White Birches glow in the morning sun on the trail. We had so much snowpack in the mountains this year, the river has been pretty much bank-full all of June and now well into July. Fast, loud, and an oddly attractive grey-green color that doesn’t come through in photographs very well. Daily entertainment is looking for new logjams, old ones swept away, and comparing the water level to yesterday. If I am away for any length of time, the web provides a substitute which is highly informative, if not nearly as engaging. 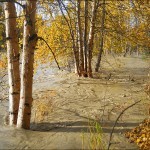 The Alaska River Forecast Center provides an ongoing record of the river level, along with its predicted behavior for the near future. This I can translate into whether or not my wheeler can make it under the bridge, and what channels will have water in them. We don’t usually have town-sponsored fireworks for the fourth of July, for the same reason we don’t have drive-in movie theaters. It doesn’t get dark. We save the big guns for the winter time. Of course that doesn’t stop people from buying enough explosives on their own to re-enact the Battle of the Bulge. Between one and two A.M. is about as dark as it’s gonna get, and the celebration is on. Nothing centralized, just skirmishes all over town and down by the river, blue smoke drifting over green water in the twilight. Not a good night for dogs. Talkeetna, Fourth of July, 11 P.M.